They are the Oathbound. Bound by their own blood using ancient rituals, they have discarded their humanoid bodies and made a pack to kill any human they find. Acting in packs and working to kill humans they find, they disguise themselves as their animal forms, wolves, and slay and human, man woman or child, they meet. Oathbound Marauders are forced to live as outcasts, never accepted by any but their own blood brothers. 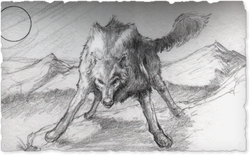 Their natural wealth is low, but their ability to transform has been twisted; they can no longer transform at will, but by day, they are a Jillecai, and at night, they are Wolf, running free on the plains and killing without mercy.